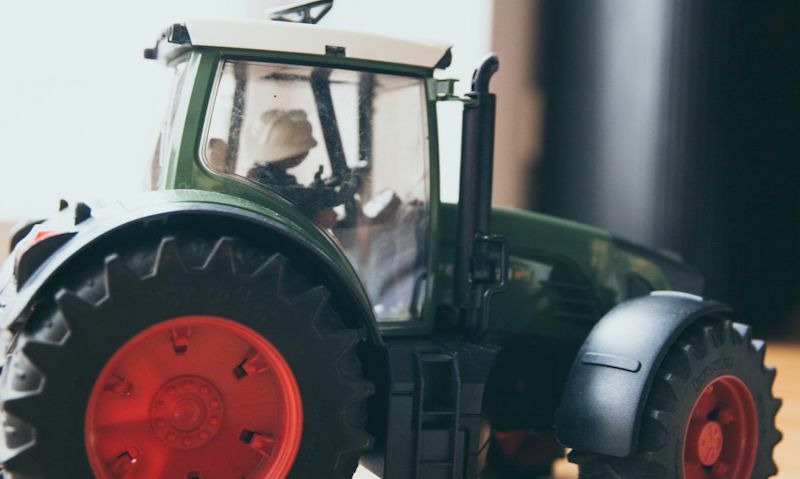 Bring a little realism to the small farm with a toy figure made to fit inside your Siku and Bruder tractor cabin. Once in a while makers find inspirational ways to improve the young farmer's experience and explore their imagination to the full. So they introduce toy farm figures for use around the farm - and this can be anything from the farmer, to his wife, kids and general farm workers. But more exciting than that comes toy tractor drivers that are made in a sitting position - with their hands out as if they are steering. This opportunity doesn't work for all, but in Bruder and Siku you can buy - off the rack - Bruder and Siku tractor drivers. We're now proud to show off these Britains (43203) Sitting Drivers in 1:32 scale. Its been a long to coming, decades even but now with the Britains tractor driving figures released, you finally get a figure to sit in your drivers cab. Hold it there though, released in the beginning of 2018, that simply means these figures are only compatible with Britains tractors in 1:32 scale, released in 2018 and onwards. And why might this be, because Britains before now never intended to fit drivers inside the cabins, so the seating was never made to fit such figures. So, in anticipation on their release, Britains have now transformed the way the seat looks inside the driver's cab so all future tractor releases can fit a driver. How might you do this, well that's simple thankfully - remove the whole drivers cabin off the body, fix the driver in place, and put the cabin securely back in place. 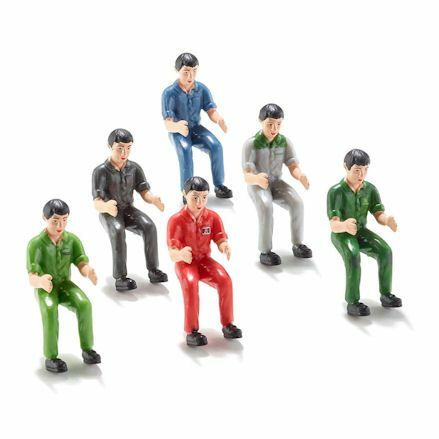 Set of four man figures, these are all static figures and don't have poseable limbs, but are positioned as if they're grasping the steering wheel. Every figure is identical, only they're wearing different overalls, so why not fit in a driver to a matching tractor. Siku's own range of driving figures are only available for their Farmer series in 1:32 scale, this is just big enough to handle with there little hands. 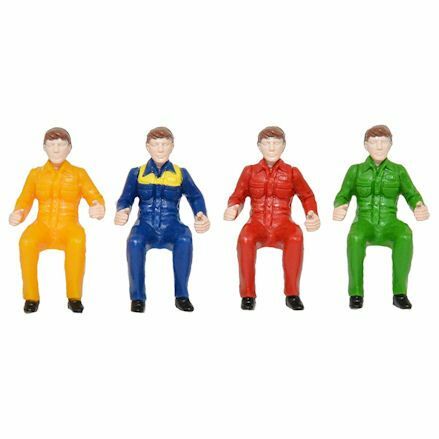 Though they're pretty much the same figure in set of two or six - you can choose a figure primarily based on the young tractor drivers favourite colour. But what Siku have done here is provided a full range of colours to match up with popular tractor manufacturers colour theme. For example; green overalls for John Deere; blue for New Holland; red for Massey Ferguson or Case IH and a couple of mismatch uniforms. Recently, Siku have introduced a set of two figures - one male, one female - so this will appeal more to both girls and boys. More importantly it's all you'll need for your Siku tractors with the two figures costing a little bit cheaper than the set of six. Well Siku introduced these figures sometime ago, its apparent these figures have since been retired, but bare in mind they're still widely available and still compatible with Siku tractors and vehicles. We would advice you to now go out a pick up this pack if its a female driver you require for the tractor, because she may soon disappear. 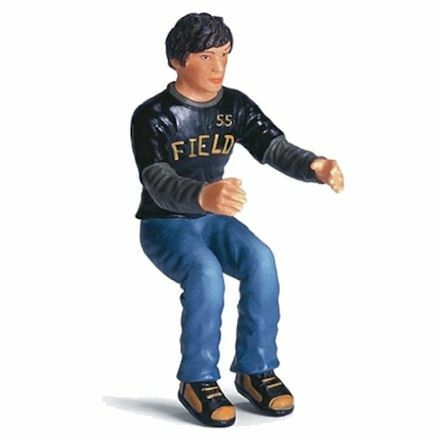 Bruder in recent years introduced a line of farm figures to their Bworld line with poseable limbs; functional in the arms, waist and knees. 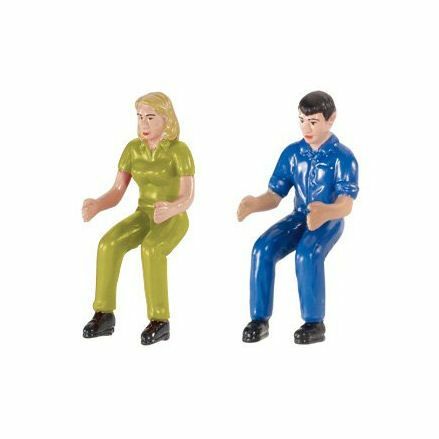 Well these figures may not be purpose-made driver's, the positioning of the limbs can be placed in a sitting down position - and will fit Bruder 1:16 tractors. These figures are approximately 4.5 inches tall with both male and female characters available. When playing in the driver's cab, you can move the legs and arms to carry out other tasks, but to sitt inside the cab - fold the leg joints with the hands grasping the wheel. Previously, you only had the one driver for the Schleich tractor and truck at the time, but things have since come along. Now available in the Farm Word series, Schleich include a driver with the tractor and pick up truck respectively, so there's no need to go out a buy a figure seperately. Better still, if you're planning to add both vehicles to the set, be assured both driving figures are different, so there's no chance of replica figures. 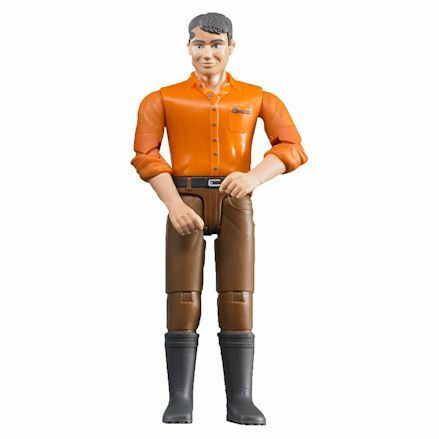 Before the only 4x4 driver figure you had (pictured) would be used for all available Schleich vehicles, and you can still use him if you can find him on the market - as he's since been discontinued, but is still compatible.